The Gunas are responsible for the behavior and mental nature of all living beings. They exists in all, including humans, animals, objects and food. In the living beings the three Gunas try to suppress each other. At no stage or time could there be a single Guna without the other two. Rajas and Tamas exist in the field of Sattva, Tamas and Sattva are found in the field of Rajas and Sattva and Rajas move in the field of Tamas. Tamas is the passive force which sustains activity. It is the quality of darkness and delusion, violence, madness, laziness, over sleeping, dullness, greed, depression, poor hygiene, insulting others, atheism, fearfulness, revenge, materialism and passivity. Rajas is the stimulating force that initiates change. It is the quality of unlimited desires and longings, selfishly motivated actions, cruelty, greed, restlessness, over excitement, mania, too much activity. People in Raja Guna are often brave when angry but scared when calm and fixed upon economic development. Sattva is the balancing force. It is the purest of three Gunas and the quality of happiness, knowledge, intelligence, patience, ability to forgive, self control, good memory, spirituality, serenity, simplicity, kindness, good hygiene, non violence, sanity, wisdom, balanced nervous system, purification of body and mind. Person with dominant Sattva Guna is less likely to suffer from disease. Disease is Tamasic state. Tamas accumulates toxins and waste materials in the body and negative feelings in the mind. 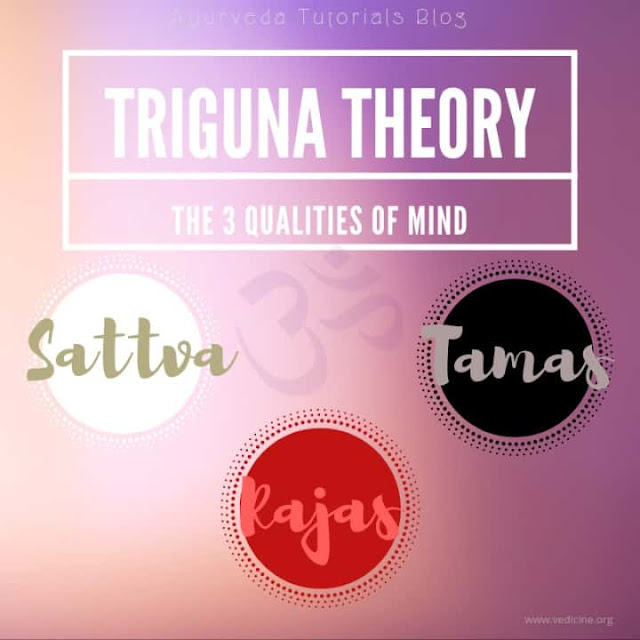 The Sattva mode can be increased through spiritual practice along with disconnecting yourself from Raja and Tama influences as much as possible. Tamasic foods bring degeneration of people’s health. Such individuals suffer from intense mood swings, insecurity, delusions and they age fast. Too bitter, too hot, too sour, too salty, too pungent or too dry foods, vinegar, onion and garlic. Foods of this type creates extra weight and fat and generate feeling of heaviness for a longer period of time after dinner. It creates greed, jealousy, anger, egoism and sexual fantasies. The food is fresh, nourishing, organic, sweet, juicy, vegetarian and cooked in a simple way. Milk, butter, ghee, honey, almonds, wheat, barley, dates, turmeric, ginger, coriander, fennel, cinnamon and cardamom and seasonal fruits and vegetables are Sattvic foods. Sattvic diet increases longevity, gives good health, happiness, and satisfaction. Since food that is consumed has a major effect on the body and the mind, a Sattvic diet should be adhered to in order to enhance both the health of the body as well as purity, strength, and calmness of the mind. By the combination of Sattva and Rajas, five sensory organs, five motor organs and mind are developed. By the combination of Rajas and Tamas, five basic elements and five tanmatras are developed. Modern science supports the proposition that three Gunas are the progenitors of their visible counterparts by describing basic formative particles (electron - Rajas, proton - Sattva and neutron - Tamas) combining in different proportions and forming atoms, elements and compounds.